Due to overwhelming demand (by 4 to 5 people) Undeclared Major now has a Store. There you will find an ample selection of brilliant artwork and literature… well, right now all I’ve got is a poster, but the brilliant artwork and literature are in the works. 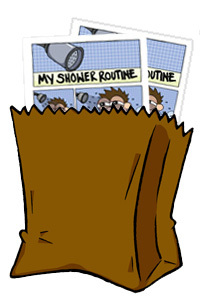 So show your support for Undeclared Major, visit the Store and grab a My Shower Routine Poster – its Undeclared Majors most popular strip – apparently I’m not the only one who enjoys 46 minute showers. Its Guaranteed to make everybody in your dorm envy you. Its not really guaranteed, but if they’re not jealous, they’re crazy and you should probably stop associating yourself with them.